For Denver's current NFL stadium, see Broncos Stadium at Mile High. 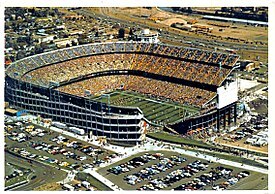 Mile High Stadium (originally Bears Stadium) was an outdoor multi-purpose stadium located in Denver, Colorado. The stadium was built in 1948 to accommodate the Denver Bears baseball team, which was a member of the Western League during its construction. Originally designed as a baseball venue, the stadium was expanded in later years to accommodate the addition of a professional football team to the city, the Denver Broncos, as well as to improve Denver's hopes of landing a Major League Baseball team. Although the stadium was originally built as a baseball-specific venue, it became more popular as a pro-football stadium despite hosting both sports for a majority of its life. The Broncos called Mile High Stadium home from their beginning in the AFL in 1960 until 2000. The Bears, who changed their name to the Zephyrs in 1985, continued to play in the stadium until 1992 when the franchise was moved to New Orleans. The move was precipitated by the awarding of a Major League Baseball franchise to the city of Denver, and in 1993 the Colorado Rockies season opened in Mile High. The team played the 1993 and strike-shortened 1994 seasons in Mile High setting MLB attendance records while Coors Field was being constructed in downtown Denver. In addition to the Broncos, Bears/Zephyrs, and Rockies, Mile High Stadium was home to several other professional teams during the course of its history. The Denver Gold of the United States Football League called Mile High home from 1983 to 1985, and the stadium played host to the inaugural USFL championship game on July 17, 1983. Two professional soccer teams also played at Mile High. The first was the Denver Dynamos of the North American Soccer League, who were founded in 1974 and played their first two seasons in Denver before moving to Bloomington, Minnesota and becoming the Minnesota Kicks. Denver was home to one of Major League Soccer's 10 charter franchises as the Colorado Rapids were formed and played in Mile High from 1996 until 2001, making them the last franchise to play in Mile High Stadium prior to its closure. After the Rapids' 2001 season, Mile High Stadium was closed and in 2002 the stadium was demolished. Mile High Stadium was originally built as Bears Stadium for minor league baseball by Bob Howsam in 1948 at the site of a former landfill. The stadium initially consisted of a single 18,000-seat grandstand stretching along the north side from the left field foul pole to the right field foul pole on the west side. Luther "Bud" Phillips hit the first official home run out of Bears Stadium. In its first full season in 1949, the Bears averaged over 6,600 per game to lead the minor leagues in attendance. In the late 1950s, there was an attempt to form a third major league, the Continental League, helmed by former Dodger general manager Branch Rickey. Howsam, who had worked with Rickey years before with the St. Louis Cardinals, joined ranks with Rickey, pleading for a major league team in Denver. Advised that to get a major league franchise Denver would need a much larger ballpark, Bears Stadium would begin the first of its many expansions. Over 8,000 seats were added to the south stands, bringing stadium capacity to 23,100. Major League Baseball's (MLB) answer to the Continental League was to expand its two Leagues, which would eventually lead to the folding of the Continental League. Although Denver was not awarded a franchise, MLB promised teams in the future for Denver and other cities. Howsam was now trapped with a massive debt load and a stadium far too big for a minor-league team. Frantically searching for a solution, he concluded the only way out was to extend the stadium's season with football. A large bleacher section was added along the south side and temporary east stands were built in 1960, raising the capacity to 34,657. Howsam's ownership in the AFL was short-lived, as overwhelming debt forced Howsam to sell all his sports interests in 1961. His dream of major league baseball in Denver would be placed on hold for another 30 years. One condition of including Denver in the AFL–NFL merger announced in 1966 was expanding Bears Stadium to at least 50,000 seats. This required adding second and third decks along the west sideline (first base line). This expansion was completed in 1968, when the stadium was sold to the city of Denver, which renamed it Mile High Stadium and built the upper deck along the west side, thus raising capacity to 50,657. The Broncos sold out every game in their inaugural NFL season. Every Broncos game—preseason, regular season (not including games with replacement players) and playoffs—has been sold out since, a streak that continued after the Broncos left Mile High. As ticket sales increased, the stadium expanded to 51,706 seats. With a $25 million bond issue in 1974 another stadium renovation added more seats. By 1976, seating was up to 63,532 as the upper decks construction was completed along the north end zone (third base line). An ingenious expansion that took place from 1975–1977 raised the capacity to 75,103 by extending the upper deck that was along the north side and building movable, triple-decked stands along the east side. When fully retracted toward the field, the stands would form a horseshoe for football, appropriate considering the team was the Denver Broncos. Yet when fully extended by 145 feet (44 m), the stadium could still fit a normal-sized baseball field with outfield distances of 335 feet down the left-field line, 375 feet to left-center and 423 to center field. The movable structure was 450 feet (137 m) long, 200 feet (61 m) wide, and weighed nearly 9 million pounds (4,500 short tons, 4,000 metric tons). When a game or event required moving the stands the 145 feet in or out, engineers pumped water into 163 water bearings spaced out beneath the stands, lifting the structure off its foundation. A sheet of water ⅓-inch thick formed under the structure. Hydraulic rams then pushed the stands forward at the rate of two feet per minute, taking stadium engineers about six hours from start to finish to move the stands. The south stands of Mile High Stadium had, for many years, a reputation for having the most vociferous fans. While not matching other cities' stadiums for rowdiness or bad behavior, the south stands ticketholders nevertheless represented some of the Broncos' most ardent fans who were able to generate an outsized impact on the noise level of the stadium despite the open gaps between the south stands and the east and west stands. In 1975, Denver approached actor Roy Rogers to commission a statue of his horse, Trigger, for display at the stadium. A 24-foot, 1,300-pound fiberglass replica of the horse had previously been produced for the Roy Rogers Museum in Victorville, California. Rogers agreed, with the stipulation that the new statue not be named "Trigger". Denver fans were polled by The Denver Post to decide on a different name, and "Bucky" was chosen. Painted white to match the Broncos logo, the statue was mounted atop the scoreboard at Mile High, where it remained for 25 years before being relocated to the new stadium. Mounted, the statue measures 27-feet and 1,600 pounds. Mile High Stadium, in the 1970s and 1980s, was the only professional-caliber baseball facility to have an all grass infield, with sliding pits around bases. This unique feature was similar to several newer Major League Baseball stadiums that also used sliding pits, except those other stadiums all had artificial turf infields. In 1986, 77 luxury suites were added atop the west stands, increasing the official seating capacity to 76,123. The final football game at Mile High Stadium was December 23, 2000, in which the Broncos routed the 49ers, 38–9. The Broncos had defeated every visiting franchise from the stadium's opening to close, enjoying perfect records against the Arizona Cardinals (3-0), Baltimore Ravens (1-0), Carolina Panthers (1-0), Green Bay Packers (5-0), and Indianapolis Colts (5-0). The Colorado Rapids were the final professional team to play in Mile High Stadium, their home since 1996. Team Captain John Spencer that year became the first Rapids player ever to record a hat trick when he scored three times against Chicago in a 3-1 win in the Rapids' annual Independence Day blowout celebration at Mile High Stadium on July 4 in front of 60,500 fans.The Rapids played the last ever professional sporting event ever held at Mile High on September 8 of this year, a 2-0 loss to the LA Galaxy. The Rapids were scheduled to play the first ever professional sports event ever held in Invesco Field at Mile High soon after, but the match was cancelled following the terrorist attacks on September 11. Mile High Stadium was closed in 2001, after the Colorado Rapids and Denver Broncos moved to neighboring Broncos Stadium at Mile High (then known as Invesco Field at Mile High), upon completion of the new stadium. The demolition of Mile High Stadium began in January 2002, an event covered extensively by local newspapers and broadcast live on television. The demolition was performed by Spirtas Wrecking Company of St. Louis, Mo., the same group that led the demolition of arenas and stadiums in St. Louis, Pittsburgh and Seattle. The stadium demolition was completed by April. The former stadium is now a parking lot for Broncos Stadium at Mile High. The historical site of many games and events for 40 years is marked by the hills forming the west and north stands, the corner between them descended by a staircase, much as the stands were. The location of home plate is identified by a marker located at 39°44′47″N 105°01′19″W﻿ / ﻿39.74637°N 105.02187°W﻿ / 39.74637; -105.02187﻿ (Mile High Stadium home plate marker). June 27, 28 and 29, 1969, concert promoter Barry Fey held The Denver Pop Festival at Mile High Stadium with many well known acts performing every evening. The city of Denver supported the festival and made available areas for camping and other services. The Denver Police however allowed non-ticket holders to enter the parking area whereupon they attempted to climb over chain link fencing to see the show while claiming that music should be "free". Police responded by lobbing tear gas canisters toward the fences knowing full well that the gas would affect everyone in attendance at the outdoor venue. Sunday night's final act was The Jimi Hendrix Experience which proved to be the Experience' final performance as a trio as well. Bassist Noel Redding quit and simply flew back to England that night. Jimi did not perform again for 6 weeks until mid August when he closed The Woodstock Music and Art Fair with his new band. Jimi Hendrix died 13 months later in September 1970. Lynyrd Skynyrd played at the Stadium June 27, 1976, as part of their One More From The Road tour. The Jacksons performed two concerts at Mile High Stadium on September 7 and 8, 1984 during their Victory Tour. The stadium was the penultimate stop on Bruce Springsteen & the E Street Band's Born in the U.S.A. Tour, where they performed two shows on September 23 and 24, 1985. The stadium hosted the final show of The 1988 Monsters of Rock Festival Tour, featuring Van Halen, Metallica, Scorpions, Dokken and Kingdom Come, on July 30, 1988. Metallica and Guns N' Roses brought the Guns N' Roses/Metallica Stadium Tour to the stadium on September 19, 1992, with Body Count as their opening act. On October 21, 1992, U2 performed at Mile High as part of the third leg of their Zoo TV Tour. U2 would return again to perform in concert May 1, 1997 on the first leg of their PopMart Tour. The stadium played host to Ozzfest on June 24, 1997. The stadium again hosted Ozzfest, for the second and last time, on June 21, 2001 and hosted the Area:One Festival on July 28, 2001. The stadium was featured in Michael Moore's 2002 documentary Bowling for Columbine as the backdrop for Moore's interview with controversial rock musician Marilyn Manson during the 2001 Ozzfest tour. Billy Graham held his "Rocky Mountain Crusade" at the stadium in 1987. In August 1993, Denver hosted World Youth Day. On August 12 and 13, Mile High Stadium hosted two events with Pope John Paul II, the Papal Welcoming Ceremony and the Way of the Cross. ^ a b c "Mile High Stadium". Project Ball Parks. 2010. ^ "Stanley E. Morse architectural records, 1924-2008-Denver Public Library". ARCHIVEGRID. OCLC Online Computer Library Center, Inc. 2008. Retrieved April 26, 2015. ^ "History of GH Phipps". GH Phipps Construction Company. 2015. Retrieved April 29, 2015. ^ a b c d Lynch, R.G. (October 16, 1949). "Denver Shows Way to Get Milwaukee Ball Park". Milwaukee Journal. p. 3, sports. ^ a b "Mile High Stadium". Ballparks of Baseball. Retrieved April 29, 2015. ^ Shrout, Brian (June 8, 2012). "Little Known Broncos Facts: We Have a General Manager?". SB Nation – Mile High Report. Retrieved April 29, 2015. Saban was a driving force behind a fund raising campaign which allowed the city of Denver to purchase the stadium and expand its seating to 50,657. The stadium was subsequently renamed "Mile High Stadium." ^ a b Moss, Irv (August 17, 2010). "Jim Tolle, Mile High Stadium stands engineer". Denver Post. Retrieved October 31, 2012. ^ "The 1993 Colorado Rockies Regular Season Game Log". Retrosheet. ^ "The 1994 Colorado Rockies Regular Season Game Log". Retrosheet. ^ "Mile High Stadium Memories". Denver Broncos – Traditions. Retrieved April 29, 2015. ^ "Bears Stadium - Denver, CO - Colorado Historical Markers on Waymarking.com". Waymarking.com. Retrieved April 29, 2015. ^ Axver, Andre; Muehlbradt, Matthias. "U2 Denver, 1992-10-21, Mile High Stadium, ZOO TV Tour - U2 on tour". U2gigs.com. Retrieved January 22, 2016. ^ Axver, Andre; Muehlbradt, Matthias. "U2 Denver, 1997-05-01, Mile High Stadium, PopMart Tour - U2 on tour". U2gigs.com. Retrieved January 22, 2016. ^ "Marilyn Manson Interview on Bowling for Columbine". Bowling for Columbine. October 11, 2002. Archived from the original on June 15, 2011. Retrieved November 15, 2010. ^ "Apostolic Journey to Jamaica, Mexico and Denver (Colorado) (August 8–16, 1993)". John Paul II: Travels. The Vatican. Wikimedia Commons has media related to Mile High Stadium.